One of this year’s locations of Climate-KIC’s summer school, The Journey, was the Hessen area in Germany, where the fifth of eight student groups started their Journey. Here is a little summary of what the students have been up to in the two weeks they spent there. The forty international participants started The Journey with a welcome and introduction session at the InterCity Hotel Darmstadt, where they got to meet with their two coaches and Journey staff before embarking on their five week programme with a focus on climate science, entrepreneurship and innovation. During the first week students had the opportunity to attend lectures by leading environmental experts in the area of climate change. The topics ranged from state of the art of climate change research and presented examples of local implementation measures to input and discussions around international climate negotiations. 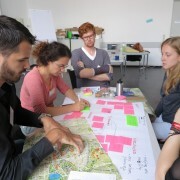 To apply their new knowledge, the students then went on a walking city tour of Darmstadt with parallel sessions organised by the coaches, where they proposed solutions how to make Darmstadt more sustainable. The programme also encompassed a special ideation workshop where participants were introduced to various methods that foster creativity and idea generation. Moreover, The Journey also involved local city representatives who spoke about the importance of climate change within their institution. They specifically addressed the barriers they are currently facing which students picked up in a role play. To show off best practise examples and inspire the students to come up with their own start up idea, each Journey includes a lot of site visits. In Hessen, the students visited the European Space Operations Centre, which showed its incubation support for start-ups as well as it gave an overview of EUMETSAT’s (European Organisation for the Exploitation of Meteorological Satellites) climate monitoring services. On a city level, the students had the opportunity to go on one of Frankfurt’s ‘Klimatours’ to learn more about sustainable buildings in the area. The group also met up with the local start-ups that had previously participated in one of Climate-KIC’s entrepreneurship programmes and learned about the need for value creation through sustainable business models. The faculty for Agricultural Sciences from the University Kassel introduced the group to the European Green Food Project, which deals with the energy consumption patterns and potential methods for energy efficiency and renewable energy integration within the food and beverage industry. The students learned about sustainable agriculture, innovative approaches to the topic by current start ups, followed by a guided tour around an organic farm. In order to facilitate team spirit and idea generation the programme encompassed some group activities including a tour to the Habichtswald forest. The Journey in Hessen ended with an elaborated process of team formation and group pitches which were concluded by a farewell event on the Fulda river. Want to learn more about #Journey2015 across Europe? Visit our #Journey2015 page and get all the latest news!